In November-December 2013, I investigated (and got Baronial funding approved for) some Baronial pennant banners for my home Barony of Politarchopolis. 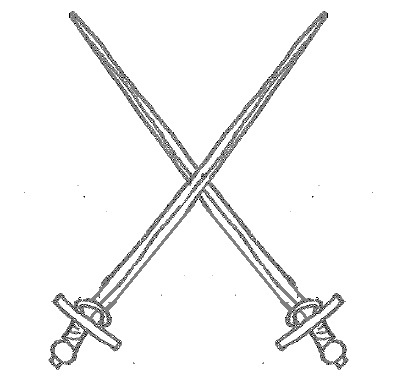 The motivation for doing so was to help make the Barony of Politarchopolis’ fencing list field more heraldic and impactful (rapier in Politarchopolis does not tend to have many banners, and I’ve never seen any Baronial, rapier specific banners before). The result was having commissioned 8 x 1.5m painted silk pennants from Lady Elizabet Hunter (of Hunter Silks on Facebook). All 8 pennants are Baronial themed (red and white with the burley griffin charge). The first set of four pennants are Politarchopolis themed with peerage motifs in the fly, in the same styles as Lady Elizabet has made for other Baronies of Lochac. The second set of four pennants match the first set of four, however, the peerage motifs in the fly are replaced by fencing motifs. 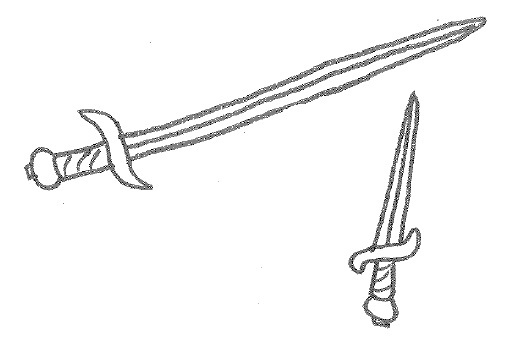 The fencing motifs are based on sketches I made, based on images from period rapier manuals. 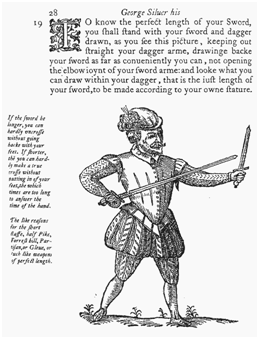 I intentionally chose four different manuals across several countries of origin, and as many different rapier forms as possible, to reflect the diversity in rapier in Politarchopolis. The following images depict the sketches I drew, and the period manual images they were each inspired by. 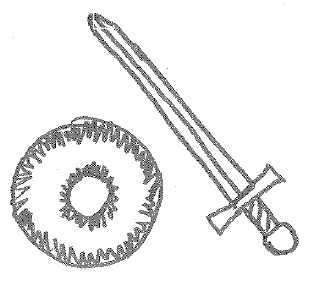 Motif 1: Buckler and sword, drawn by Ceara Shionnach in January 2014, as adapted from source 1. Source 1: Motif 1 was inspired by Ms. I.33, the earliest known rapier manual from 14th century Franconia (Germany). 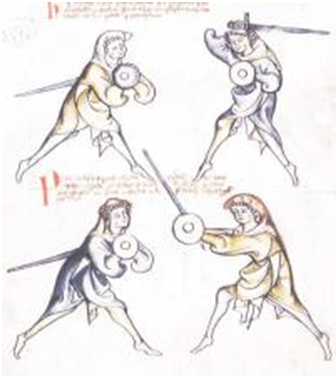 (source plate 15r (29) as published by Royal Armories).The buckler was based on that used by the top left figure and the sword was based on the sword shown being used by the top right figure. Motif 2: Sword and dagger, drawn by Ceara Shionnach in January 2014, as adapted from source 2. Source 2: Motif 2 was inspired by the 16th century English manual ‘Paradoxes of Defence’ by George Silver. This image is from plate 28, as published by The Linacre School of Defence. 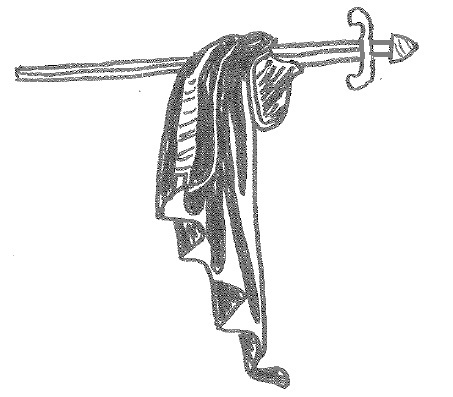 Motif 3: Sword and cloak, drawn by Ceara Shionnach in January 2014, as adapted from source 3. Source 3: Motif 3 was inspired by images published by the Italian fencing master Di Grassi in 1570. 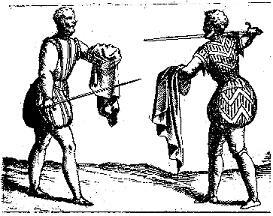 This image, “Rapier and cloak” is published on Basic Rapier Fighting Styles by Tivar Moondragon. Motif 4: Crossed case of rapier, drawn by Ceara Shionnach in January 2014. Source 4: Unfortunately I’ve had some issues with my files and I can’t find the full source image for this (only a partial image with no source). If I find the original source, I’ll post it up. The eight pennants have been completed by Lady Elizabet, and are to be delivered the weekend of 1 February, 2014. I’ll take photos of them and post them up here on the weekend. How exciting!